يضمن فندق شقق ماونتس باي ووترز الذي رمم في لزائريه قضاء وقت ممتع في هذه المدينة الخلابة سواء جاؤوا في رحلة عمل أو سياحة. إن موقعه الجيد الذي يبعد فقط عن مركز المدينة يساعد النزلاء على الاستمتاع بمعالم المدينة ونشاطاتها. سوف يعشق النزلاء موقع هذا الفندق، فهو قريب من أهم المعالم السياحية في المدينة . كما يقدم شقق ماونتس باي ووترز الكثير من الخدمات لإغناء رحلتك في المدينة. يمكن للنزلاء الاستمتاع بالميزات التالية: واي فاي مجاني في جميع الغرف, خدمة التنظيف يوميًا, مكتب الاستقبال على مدار الساعة, مرافق مخصصة لذوي الاحتياجات الخاصة, تخزين الأمتعة أثناء إقامتهم في هذا المكان الرائع. تنعكس أجواء شقق ماونتس باي ووترز في غرف الضيوف.غرف لغير المدخنين, مكيف هواء, تدفئة, مكتب, شرفة/ تراس هي بعض الميزات الموجود في العديد من الغرف. يقدم الفندق مجموعة رائعة من الخدمات كمثل مركز للياقة البدنية, حمام سباحة خارجي, ملعب تنس, حديقة، لجعل إقامتك تجربة لا تنسى. يحظى فندق شقق ماونتس باي ووترز بموقع ممتاز وخدمات يصعب منافستها. يرجى العلم أن مكتب الاستقبال يقع في طريق 112 ماونتس باي، بيرث (ماونتس باي تاور). سعر وجبة الإفطار ينطبق على وجبة الإفطار الكونتيننتال. يُرجى العلم أن الواي فاي المجاني متوافر بحد يبلغ 150 ميجابايت. يطلب العقار مبلغ تأميني مسترد قيمته تتراوح من 100 دولار أسترالي إلى 500 دولار أسترالي عند تسجيل الوصول، وتعتمد القيمة على نوع الغرفة. يجب سداد المبلغ عند الوصول. Clean apartment. Great location on Kounts Bay road close to city Kings park and Swan river and waterfront. 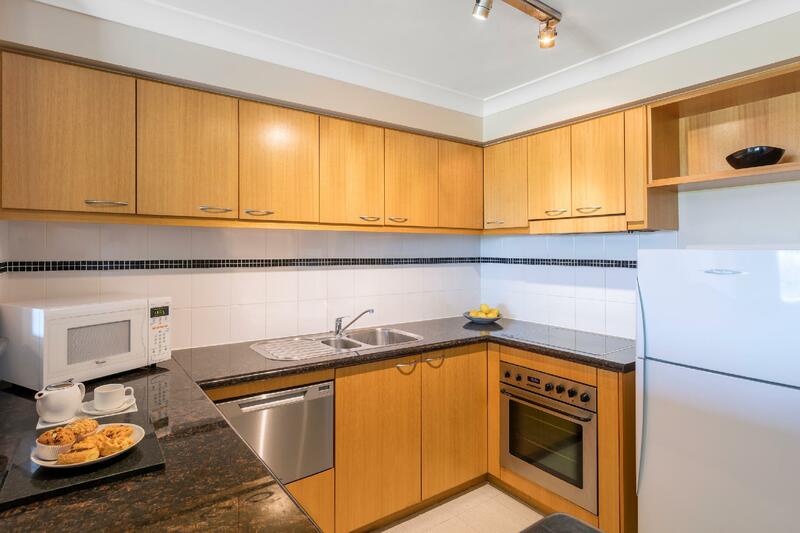 Very large serviced apartment with all the utensils and crockery cutlery needed with dishwasher and washing machine. Highly recommended and great value. Would definitely stay here again. The room was comfortable. The room had everything we needed. I was however struggling to figure out what was on tv as some of the guide options didn’t work, and I would love to of had something telling me what factilities, eateries etc were around me. Restaurant does open for lunch nor is there room service for breakfast or lunch. We are a big family of 5. Having a washer & a dryer in the apartmeny really ease us. Room was very clean & smells great. Great house keeping & friendl staff. Just the location is quite a bit of a walking distance to & ffom city centre but theres a bus stop with free bus ride outside the hotel. The bedroom has a window. The living room is on the inside, so, no window, no air, no light. The aircon is in the bedroom and blows the cold air right onto the bed. When you’re sitting in the living room, however hard you have the aircon blowing, no cold or other air is coming your way. It stays hot inside. Wifi is free, yes, but limited to 2 GB per day. Connection is good. The apartment definitely needs a facelift and could be cleaner (stains on the sofa). The pillows were smelling badly, thus needed to be washed. The room was great, very spacious and comfy with everything you need, the view from our room was nothing great, just a graffiti wall. But it’s in a great location, close to everywhere we wanted to go. And the staff were helpful when I had to call housekeeping and very prompt. Very happy with our stay. The only thing I wasn’t aware of is that we had to pay a $300 bond which I thought was a bit extreme. 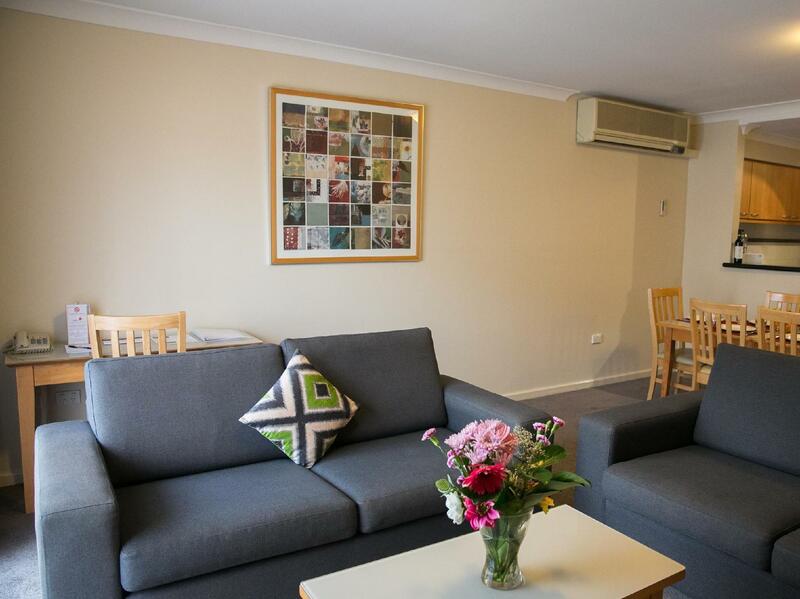 Comfortable, spacious and clean apartment with daily cleaning service! Check in was easy and fast, customer service was great. All in, very satisfied and better than we expected. Keep it up, we'll be back. Stayed here for three days with my family. 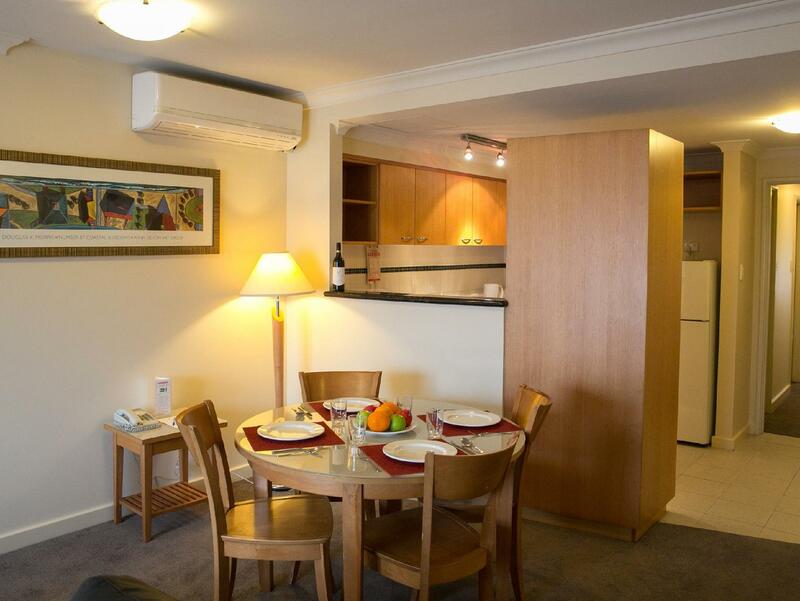 The room is spacious and the kitchenette is well-equipped. With free parking facilities, this place is perfect for small families here for a short holiday. Centrally located, it's a short drive to most places. However it's about time they renovate the place before things start getting really tired. All in all a pleasant stay and I would definitely come back again. 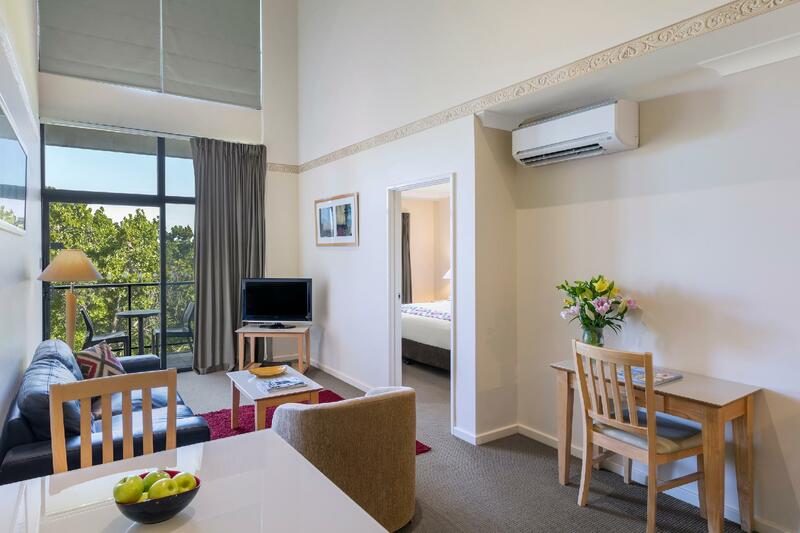 - Stayed there in end May / beginning June 2015 with pregnant wife and 1.5 year old son - Loved the size of the apartment which was not too big and not too small and was cleaned everyday like in a serviced apartment - Professional service by staff - Location is excellent as it's close to the city centre and King's Park and not much traffic immediately outside. Only 5-6 blocks from attractions, quiet, spacious, full kitchen and bath, in suite laundry, free under ground parking, excellent wifi, restaurant on site. Close to city yet away from it. Convenient bus stop just outside. Well appointed. Complimentary car parking a plus. Dusty old blanket gave me sinus infection. Only air con in 1 bedroom. Front room was very hot. 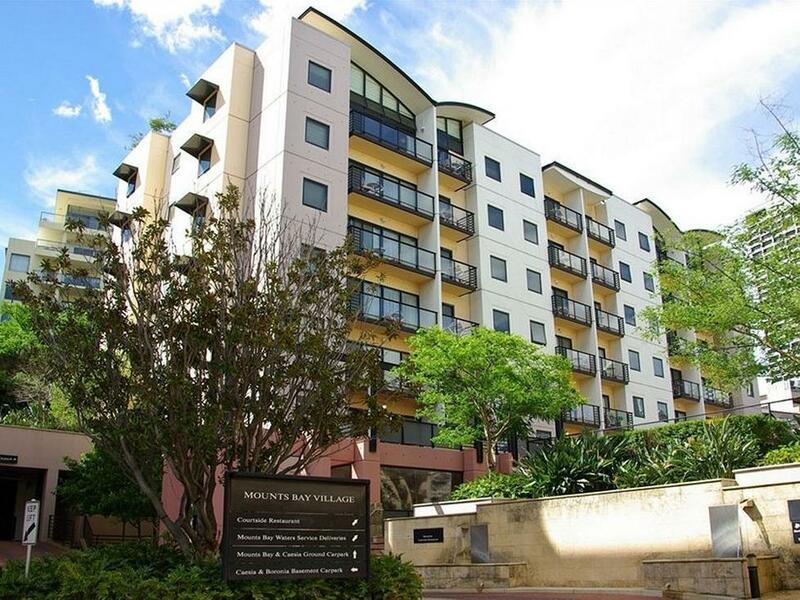 We always stay at Mounts Bay Waters Apartments when we attend work functions or need a family weekend to escape the daily grind of work and school. It is accessible to the city center via walking or there is a bus stop right outside the front. The staff are always friendly, welcoming and eager to please, the rooms are spacious and comfortable. We highly recommend this establishment to anyone who wants a great place to stay family. We are here end of December, summer is quite hot, only one aircon at living room, no aircon in the room. We have keep door open and sleep .